Acid rock is a loosely defined type of rock music that evolved out of the mid 1960s garage punk movement and psychedelic subculture. The term, which derives its name from lysergic acid diethylamide (LSD), is sometimes deployed as a synonym of "psychedelic rock", but it may also refer to a more musically intense subgenre or variation of the psychedelic rock style. Acid rock is generally defined by distorted guitars, lyrics with drug references, and long improvised jams. Distinctions between other genres can be tenuous; it may also encompass certain garage rock, 1960s punk, proto-metal and heavy, blues-based hard rock. When distinguished from "psychedelic rock", acid rock may contain harder and heavier qualities that encapsulate the positive and negative extremes of the psychedelic experience. As the psychedelic movement progressed into the late 1960s and 1970s, elements of acid rock split into two directions, with hard rock and heavy metal on one side and progressive rock on the other. In the 1990s, the stoner metal genre combined acid rock with other hard rock styles such as grunge, updating the heavy riffs and long jams found in acid rock and psychedelic-influenced metal. Bands credited with creating or laying the foundation for acid rock include garage rock bands such as the 13th Floor Elevators and Count Five. The blues rock group the Paul Butterfield Blues Band are also credited with spawning the harder acid rock sound, and their 1966 instrumental "East-West", with its early use of the extended rock solo, has been described as laying "the roots of psychedelic acid rock" and featuring "much of acid-rock's eventual DNA". Originating in the early 1960s, garage punk was a mainly-American movement that involved R&B-inspired garage rock bands powered by electric guitars and organs. It was mainly the domain of untrained teenagers fixated on novelty sonic effects, such as wah-wah and fuzz tone, and relied heavily on riffs. The music later blurred into psychedelia. American garage bands who played psychedelic rock retained the rawness and energy of garage rock, incorporating heavy distortion, feedback, and layered sonic effects into their psychedelic music. Bisport and Puterbaugh, defining acid rock as an intense or raw form of psychedelia, include "garagey" psychedelia under the label of "acid rock" due in part to its "energy and intimation of psychic overload". The earliest known use of the term "garage punk" appeared in Lenny Kaye's track-by-track liner notes for the 1972 anthology compilation Nuggets: Original Artyfacts from the First Psychedelic Era, 1965-1968, which prominently featured both acid rock and garage rock. Musicologist Simon Frith cites Nuggets as a showcase for the garage psychedelia of the 1960s and its transition between early 1960s garage rock and the more elaborate acid rock of the late 1960s. This acid rock present in the Nuggets anthology has been described as an offshoot of 1960s punk rock. [nb 5] Bands such as Count Five, with their 1966 song "Psychotic Reaction", as well as other groups featured on Nuggets, would eventually epitomize the overlap between 1960s garage rock and psychedelic punk. As one of the first successful acid rock songs, "Psychotic Reaction" also contained the characteristics that would come to define acid rock: the use of feedback and distortion replacing early rock music's more melodic electric guitars. Another group included on the Nuggets album, the 13th Floor Elevators, began as a straight garage rock band before becoming one of the original early acid rock bands and the innovators of psychedelic rock in general, with a sound consisting of distortion, often yelping vocals, and "occasionally demented" lyrics. Hailing from Austin, Texas, the 13th Floor Elevators and their frontman Rocky Erickson have been described as pioneers of acid rock. Their debut album, The Psychedelic Sounds of the 13th Floor Elevators, featuring the garage rock hit "You're Gonna Miss Me", was among the earliest psychedelic rock albums. By 1966, the New York City garage band the Blues Magoos were referring to their wailing blues rock as "psychedelic music", and their hard variant of psychedelic rock, with its roots in the garage movement, would be increasingly labeled "acid rock". Acid rock often encompasses the more extreme side of the psychedelic rock genre, frequently containing a loud, improvised, and guitar-centered sound. Alan Bisbort and Parke Puterbaugh write that acid rock "can best be described as psychedelia at its rawest and most intense [...] Bad trips as well as good, riots as well as peace, pain as well as pleasure - the whole spectrum of reality, not just the idyllic bits, were captured by acid rock." "Acid rock" has also been described as more heavily electric and containing more distortion ("fuzz") than typical psychedelic rock. 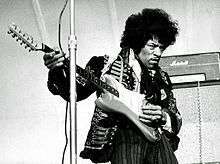 By the late 1960s, in addition to the deliberate use of distortion and feedback, acid rock was further characterized by long guitar solos and the frequent use of electronic organs. Lyric references to drug use were also common, as exemplified in Jefferson Airplane's 1967 song "White Rabbit" and Jimi Hendrix Experience's 1967 song "Purple Haze". Lyrical references to drugs such as LSD were often cryptic. Crossover in the two psychedelic rock variants did occur; the Animals' song "Sky Pilot" was among the few songs of the era to juxtapose the elaborate orchestration of Sgt. Pepper-influenced, British-style psychedelic rock with the more Hendrix-influenced, electric guitar-centered American acid rock style. At a time when many British psychedelic bands played whimsical or surrealistic psychedelic rock, many 1960s American rock bands, especially those from the West Coast, developed a rawer or harder version of psychedelic rock containing garage rock energy. When contrasted with whimsical British psychedelia, the harder American West Coast variant of psychedelic rock has been referred to as acid rock. [nb 6] American psychedelic rock and garage bands such as the 13th Floor Elevators epitomized the frenetic, darker and more psychotic sound of American acid rock, a sound characterized by droning guitar riffs, amplified feedback, and guitar distortion. Hoffman writes that it lacked the recording studio "gimmickry" that typified the more Beatles-influenced strain of psychedelic rock, though acid rock experimented in other ways with electrified guitar effects. The influence of acid rock was evident in the sound of heavy metal in the 1970s. Iron Butterfly's "In-A-Gadda-Da-Vida" is sometimes described as an example of the transition between acid rock and heavy metal or the turning point in which acid rock became "heavy metal". "In-A-Gadda-Da-Vida" serves a notable example of 1960s and early 1970s acid rock or heavy psychedelic rock, and the band would continue to experiment with distorted, "fuzzy", heavy psychedelia into the 1970s. Both Iron Butterfly's 1968 album In-A-Gadda-Da-Vida and Blue Cheer's 1968 album Vincebus Eruptum have been described as greatly influential in the transition of acid rock into heavy metal. Heavy metal's acid rock origins can further be seen in the loud acid rock of groups such as Steppenwolf, who contributed their song "Born to Be Wild" to the soundtrack of the 1969 film Easy Rider, which itself glamorized the genre. Ultimately, Steppenwolf and other acid rock groups such as Cream, the Jimi Hendrix Experience, and Led Zeppelin paved the way for the electrified, bluesy sound of early heavy metal. 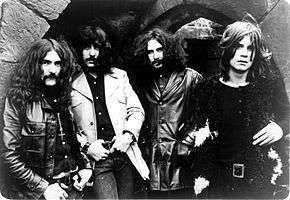 By the early 1970s, bands such as Deep Purple, Led Zeppelin and Black Sabbath combined the loud, raw distortion of acid rock with occult lyrics, further forming a basis for the genre now known as "heavy metal". At a time when rock music began to turn back to roots-oriented soft rock, many acid rock groups instead evolved into heavy metal bands. As its own movement, heavy metal music continued to perpetuate characteristics of acid rock bands into at least the 1980s, and traces of psychedelic rock can be seen in the musical excesses of later metal bands. In the 1990s, the stoner metal genre combined acid rock with other hard rock genres such as grunge, updating the heavy riffs and long jams found in the acid rock and psychedelic-influenced metal of bands such as Black Sabbath, Blue Cheer, Hawkwind, and Blue Oyster Cult. ↑ Exemplary acts of "garagey" psychedelia include Blues Magoos, the Electric Prunes, and the Music Machine, all of which may fall under the label of acid rock. ↑ Hard rock and heavy metal have also been described as evolving from psychedelic rock. Hard rock (or heavy metal) have been described as an "evolutionary form of 1960s acid rock". 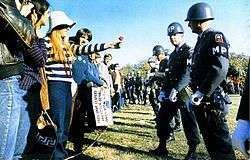 ↑ Rauls believed that, at the time, "acid rock" was used to refer to "progressive rock". Writer Vernon Joyson observed flirtations with acid rock in the Beach Boys' albums Pet Sounds (1966) and the unfinished Smile. ↑ Joyson notes that the Doors' acid rock music was markedly different from their San Francisco contemporaries; that the Doors "took the acid experience less literally". ↑ At the time, the term "punk rock" referred to the garage rock of the 1960s, such as that present in the Nuggets compilation. ↑ British psychedelia was often more arty in its experimentation, and it tended to stick within pop song structures. Along with its whimsical and surrealist tendencies, British psychedelic rock was generally not as minimalist and not as aggressive as its American counterpart, often featuring longer song arrangements and incorporating Eastern instruments such as sitars. 1 2 3 4 5 6 7 8 9 10 11 Browne & Browne 2001, p. 8. 1 2 Hull 2003, p. 380. 1 2 3 4 5 6 7 8 9 Hoffmann 2004, p. 1725. 1 2 3 4 5 Knowles 2010, p. 199. 1 2 "Loyola entertainment law journal". Loyola Entertainment Law Journal. 6: 90. 1986. ↑ Holm-Hudson 2013, p. 85. 1 2 Stoner Metal at AllMusic. ↑ Gammond 1991, p. 3. ↑ Wolfe 1968, p. 223. ↑ Rolling Stone Magazine Staff, p. 195. ↑ Hoffmann 2004, p. 1725, "Psychedelic rock was sometimes referred to as 'acid rock. '"; Browne & Browne 2001, p. 8, "acid rock, also known as psychedelic rock"; DeRogatis 2003, p. 9, "now regularly called 'psychedelic' or 'acid'-rock"; Larson 2004, p. 140, "known as acid rock or psychedelic rock"
↑ Drabløs 2016, p. 64. 1 2 Freeman & Freeman 1996, p. 10. ↑ McLauchlin 2015, p. .
1 2 3 Bisbort & Puterbaugh 2000, p. 31. ↑ Bill 1984, p. 37. ↑ Academic American Encyclopedia (Vol 16 ed.). Grolier. 1985. p. 249. ↑ Henderson & Stacey 2014, p. .
↑ Waksman 2001, p. 262. ↑ Szatmary 2014, pp. .
1 2 Szatmary 2014, p. 158. 1 2 Moore 2015, p. 126. ↑ Roberts, Randall. "Laying the odds on the Rock Hall of Fame nominees". NorthJersey.com. Retrieved 1 May 2016. ↑ Erlewine, Michael. "East-West Live - The Paul Butterfield Band". Allmusic.com. Retrieved 1 May 2016. ↑ Giles, Jeff. "How the Paul Butterfield Blues Band Earned Its Spot in the Rock and Roll Hall of Fame". Ultimate Classic Rock. Retrieved 1 May 2016. 1 2 Kuhn 1999, p. 1507. 1 2 Romano 2010, pp. 17–18. ↑ Joyson 1984, p. 8. ↑ Larson 2004, p. 141–144. ↑ Powledge, Fred. "Wicked Go The Doors". Life (April 12, 1968). ↑ Joyson 1984, p. 59. 1 2 Hann, Michael (July 30, 2014). "10 of the best: garage punk". The Guardian. Guardian News and Media. Retrieved June 18, 2016. ↑ Reynolds 2012, p. 150. 1 2 Psychedelic/Garage at AllMusic. ↑ Nobles 2012, p. 32. ↑ Case 2010, p. 265. ↑ Frith 2004, p. 98. ↑ Shaw, Greg (Jan 14, 1978). "New Trends of the New Wave". Billboard. Retrieved 23 November 2015. ↑ Austen, Jake (2005). TV-a-Go-Go. Chicago Review Press. ISBN 978-1-56976-241-7. ↑ Eder 2001, p. .
1 2 Unterberger 2002, p. 1135. ↑ Unterberger, Richie. "You're Gonna Miss Me - Song review". allmusic.com. ↑ Luft 2009, p. 173. ↑ Perone 2001, p. 56. ↑ Brend 2005, p. 88. 1 2 O'Brien, Lucy M. "Psychedelic Rock". Encyclopædia Britannica. Encyclopædia Britannica. Retrieved 27 April 2016. 1 2 Dasher 1985, p. 67. 1 2 Misiroglu 2015, p. 10. ↑ Larson 2004, p. 140–141. ↑ Brown 1986, p. 148. ↑ Weinstein 2009, p. 19. 1 2 3 Rood 1994, p. 6. 1 2 Bukszpan & Dio 2003, p. 288. ↑ Smith, Nathan. "The Warning: The 10 Heaviest Albums Before Black Sabbath". Houston Press. Retrieved 26 April 2016. ↑ Unterberger 2002, p. .
↑ Kirkpatrick 2011, pp. 27–28. ↑ Browne & Browne 2001, p. 687. ↑ Godfrey & Leigh 1998, p. 2. ↑ Henderson & Stacey 2014. Hull, Robot A. (2003) . "Sound and Visions: Psychedelia". In Hoskyns, Barney. The Sound and the Fury: 40 Years of Classic Rock Journalism: A Rock's Backpages Reader. Bloomsbury USA. ISBN 978-1-58234-282-5.